Source: Vermont Indexable Tooling, Inc.
Indexable back spot facing tools provide back spot facing capability without operator intervention or circular interpolation on turning and machining centers. Using an elliptical neck design that maintains strength and rigidity, the tools enter and exit the hole using only spindle orientation and offset positioning. The system also maintains hole tolerance by not piloting the hole, thus eliminating the possibility of galling, seizing, or wear. 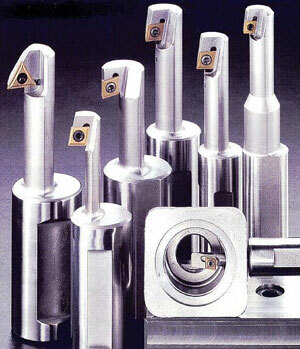 The tools use standard inserts, and models with through-coolant capability are available. Vermont Indexable Tooling Inc., 50 Gonyeau Rd., Suite 103, Milton, VT 05468. Phone (800) 639-1616.